« Ain’t No Party Like A Karen Bass Party! For the past couple months, I’ve been doing freelance outreach gigs for The Robert Group, a public affairs firm contracted by Metro to facilitate and do outreach for community meetings for some of their projects, such as the Westside Metro Purple Line subway extension (a.k.a. “The Subway To The Sea”). Another such project is a planned beautification and upgrading of the Imperial/Wilmington (Rosa Parks) station, which is the transfer station for the Metro Blue and Green lines, one of the most heavily used light rail stations in the 78-mile Metro Rail system. The last of three community meetings for the station upgrade project is coming up this Saturday, February 13, from 10 a.m. to 12 noon at Ronald McNair Elementary School (in the cafeteria), located at 1450 W El Segundo Bl, about a mile to the southwest of the station, in nearby Compton. You are invited to attend a community workshop to develop a Beautification Plan for your neighborhood. Please plan to join us at the final community workshop to view the conceptual station design to improve pedestrian access and safety at the Wilmington/Imperial/Rosa Parks Blue Line station. At the January 9, 2010 meeting, Metro’s presentation of the initial concept included the creation of a pedestrian plaza, partial relocation of the bus bays, and relocation of short-term parking, and construction of a new parking structure across from the station to serve Metro riders who drive to the station. Your participation and feedback is very important during this stage, and throughout the station improvement planning process. Go Metro: Ride lines 53 and 205. Visit metro.net to find out how to get to the meeting using Metro. If you drive, parking is available in the school’s parking lot located on El Segundo Bl. For more information about the project please contact Ginny Brideau at ginny@therobertgroup.com or 323.669.7654. On Wednesday, I spent a few hours at the station passing out fliers and encouraging Blue and Green line riders there to come to the meetings. In the past, I’ve done this during p.m. rush hour, in which people were in a literal rush to catch their trains or connecting buses, not to mention asked by L.A. County Sheriff’s deputies to either move or leave the station premises because it looked like I was soliciting and that I didn’t have any official Metro credentials on me. This time, it was different. The Robert Group’s Ginny Brideau and I arranged to get our very own bright orange Metro staff safety vests from a Rail Operations manager yesterday and we did some outreach at the station that morning. Once with the Metro vests on, I suddenly felt invincible. This time the Sheriff’s deputies and fare inspectors knew we were there, and people were more eager to pick up what we had to distribute, lest they thought we were hawking any sort of commercial/religious/political propaganda . Today, while standing on the northern end of the Blue Line platform ramp, I passed out 1,000 fliers and conversed with a few riders, who were a little more relaxed than in the rush hour period. The cyclical cacophony of train horns, crossing gate bells and the high-pitched whine of LRV motors, over the white-noise bed of the 105 freeway roar was my soundtrack. Each train that arrived from either direction signaled a new set of fliers to pass out, at times people crowding around to get one. 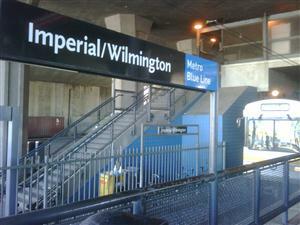 In this unincorporated community of Willowbrook, while it’s not as aesthetically blighted as one would assume “the ghetto” to be, it is a very low-income community and this station has the highest levels of crime in all of the Metro Rail system, an ironic statistic due to the Sheriff’s station located directly adjacent to the station. The shopping plaza that abuts the station is a row of fast food joints, check cashing offices and discount stores, and across the street is the county-run Martin Luther King Jr. Medical Center, famous for its no-longer-operating trauma center. Community involvement, a much needed element, can be a hard sell in communities like these, even for something as simple and relatively non-controversial as a transit station beautification project. So by far the most fascinating aspect of my work here today was the exchanges I had with people. Most people inquired whether the fliers were job applications or announcements. More than several times, I got, “You got jobs?” or “Is Metro hiring?” comments – no doubt a telling indicator of our current economic state. Surely this beautification project involves construction and landscaping work, and I encouraged them to attend the meeting to voice the need for this project to hire labor locally. One woman glanced at the flier and said, “Ronald McNair Elementary? I used to teach there…I might be teaching there again.” We chatted a bit about her familiarity with the school and she indicated that she would want to attend, but was committed to be in church the whole day. She later said her church was near the station and I encouraged her to spread the word to the church’s pastor, staff and congregation, of which she grabbed a good chunk of fliers and promised that she’d spread the community meeting gospel. Another woman, like many, asked me what the meeting was for. “They’re going to be improving the station, adding some more lighting, building more parking, they want people from the community to give their input.” Then she put her hand on my back, in an appreciative gesture, proceeded to grab a bunch of fliers for herself and said, “I’m going to Martin Luther King (medical center)!” I thanked her. Having been doing The Community Thing for this many years, one of the main lessons I’ve learned is that outreach is sooo much more effective and rewarding when others help you do it. Other people, assuming I was Metro staff, asked me for transit information and directions. Fortunately I knew most if not all the answers. Yesterday I helped a family on vacation from India get to Disneyland (“Take the Green Line to the end of the line in Norwalk, then take the 460 bus”). Today was mostly telling people which side of the platform to use to take the train to their intended destination. And where in the past, Sheriff’s deputies would dissuade me from my tasks, I was totally cool with them now. 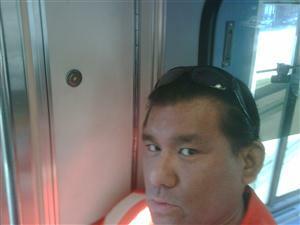 In fact, one of them even asked me who to contact because the upper-level Green Line ticket machine was down. But this time, a “fellow” Metro-Vested staffer voiced his displeasure at my activity. I reached down, picked it up, crumpled it and put it in his trash can. I didn’t hear from him again. The other 999 fliers were safely in people’s hands, as far as I can tell.